Our Jerky and meat sticks are cut from USDA inspected meats. 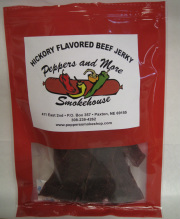 We use beef for jerky and sticks that others use for premiere burger and high end roast cuts. We are sure you'll find our jerky and sticks to have enjoyable texture and flavor. No MSG, Gluten or Nitrates.